The pace of growth for US private payrolls stumbled in August, but last month’s deceleration doesn’t translate into a warning sign for the business cycle. That’s the message in yesterday’s monthly update of the Federal Reserve’s Labor Market Index (LMCI), a multi-factor benchmark that’s designed as a comprehensive measure of the broad trend for job-market indicators. Expectations for low recession risk also finds support in initial jobless claims numbers and a markets-based proxy for estimating business cycle conditions. 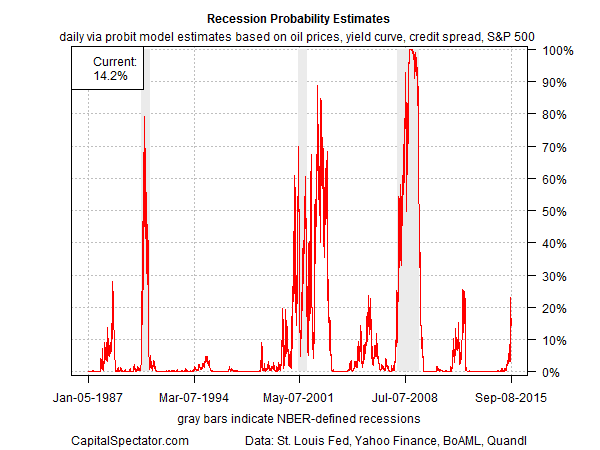 A more reliable estimate of recession risk through August will arrive with the monthly update of the Economic Trend & Momentum indices that’s scheduled for later this month at CapitalSpectator.com. Meantime, the early clues suggest that macro risk is still low for the US. The one caveat: recent turbulence in financial and commodity markets, which suggests that macro risk has moved moderately higher in recent weeks. Even so, the increase still falls short of a clear warning. Meantime, there’s been no confirmation of substantial deterioration in the trend via the hard economic numbers to date, which suggests that elevated risk levels via a markets-based prism in recent weeks may be noise. As for a broad-brush review of the labor market, LMCI increased to +2.1 in August, a seven-month high. “The LMCI generally declines during recessions and typically rises during expansions,” according to the Fed. By that standard, last month’s report suggests that the economy continued to expand through August. The upbeat message is also clear and unambiguous after translating LMCI’s historical record into recession risk estimates via a probit model. Analyzing the data with this method indicates that the broad macro trend remains positive for the US. 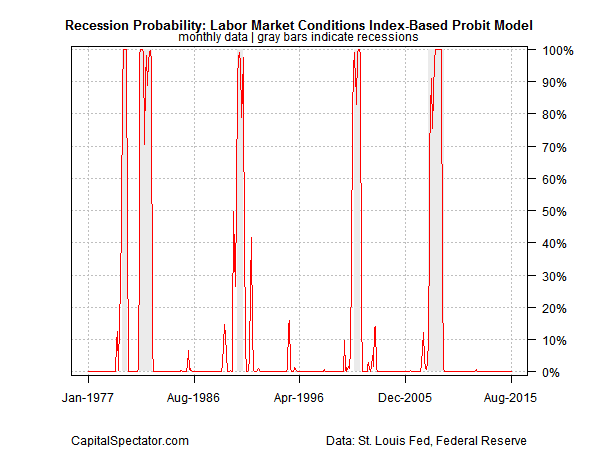 Based on the LMCI reading through August, the probability is virtually nil that NBER will declare last month as the start of a new US recession. 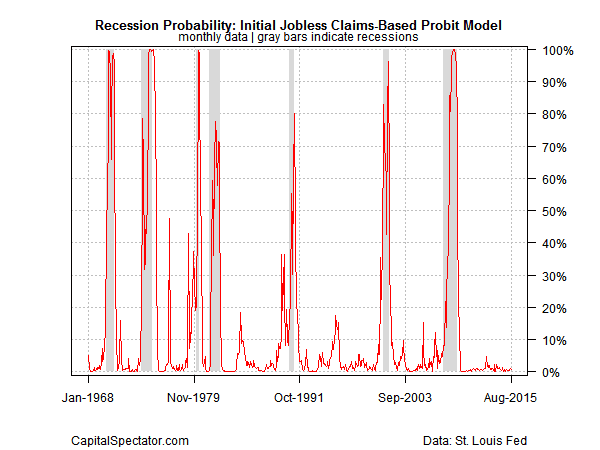 Estimating current macro conditions through the prism of jobless claims (based on monthly averages) tells a similar story, namely: business cycle risk remains low. As a check on the signals generated by the labor market, let’s turn to a real-time approximation of economic conditions via a probit model that analyzes four data sets on a daily basis: the US stock market (S&P 500); the Treasury yield curve (10-year yield less the 3-month T-bill yield); the credit spread (BAA-rated bond yield less AAA yield); and spot crude oil prices (based on the US benchmark, West Texas Intermediate). The current estimate has popped higher in recent weeks, although it’s pulled back slightly, dipping to around 14% as of Sep 8 after reaching 23% earlier in the month. The bottom line: the probability is still low that an NBER-defined recession has started for the US, according to this methodology.